The Eleventh Circuit Court of Appeals, in an unpublished sixteen-page opinion, has affirmed Mutual Benefits Corp. principal Joel Steinger's guilty plea, and twenty-year sentence, holding that he was competent to enter a plea, based upon medical and psychiatric evidence. The basis for Steinger's appeal. that he was not competent to plead out, due to the massive amount of medication he was taking for pain, conflicted with prior findings of court-appointed medical professionals, and his own physician, and his conduct during hearings, which failed to show any diminished capacity due to pain medication, or any mental issues. According to the federal Bureau of Prisons, Joel Steinger's presumptive release date is July 3, 2029. This month, Scott Rothstein's former law partner, Russell Adler, was released from Federal Prison, after serving a little more than one year of his 2 1/2 year sentence. You may recall that Adler was never charged with any role in Rothstein's billion dollar Ponzi scheme, which sold its victims the right to collect on bogus legal settlements. He entered a guilty plea to Federal laws involving contributions to individuals running for public office. Many court observers were puzzled why a name partner in Rothstein's law firm, who would have had some level of involvement in the complicated Ponzi scheme, was only charged with a minor Federal felony. The crime Adler pled to was only tangentially related to the massive criminal conspiracy that was being managed at the law firm. Are we missing something ? He is headed for a halfway house, which may be as much as six months of his sentence. The question I have is this: I was no math major at the university, but how does the length of his sentence agree with the short period of time that he was in Federal custody ? The court file does not reflect a sentence reduction, nor are there any sealed pleadings, which might contain such an order. The victims of Scott Rothstein's Ponzi scheme deserve to know. 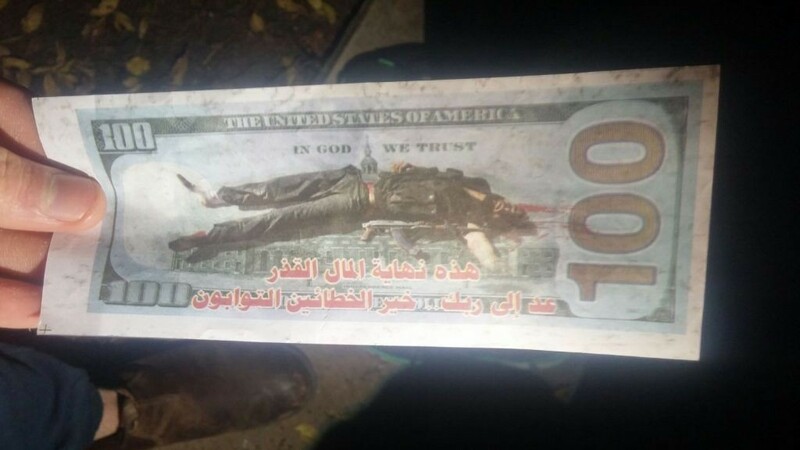 The above bill was seized by the authorities in northern Israel. Perhaps now the world's financial community will start taking the economic threats posed by ISIS/ISIL a/k/a "Islamic State" more seriously. The reverse side of the bill shows a deceased fighter, with Independence Hall sticking through his body. 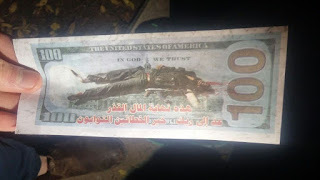 The English translation of the Arabic reportedly says "This is the end of dirty money. Return to your god, the best sinners are the ones who repent." Doctor Herbert Minnis, a leader of the Opposition in the Bahamian House of Assembly, has accused his country's government of continuing to conduct business with a "man known to swindle," after information surfaced about Cayman Islands resident Ryan Bateman, who is both a fugitive from justice, and accused of absconding with over $450m in funds of Canadian & American pensioners. He made these allegations, publicly, in open session of the Assembly. Ryan Bateman, who reportedly has been issued seven government licenses to drill for oil, within Bahamian sovereign waters, is wanted in Grand Cayman, on charges of violent domestic abuse, and reliable sources there have stated that he committed sexual battery upon a former spouse. Bateman broke the conditions of his pretrial bail when he failed to return to Grand Cayman for trial. According to Bahamian media, Bateman has alleged that the arrest warrant is not longer outstanding, but Cayman residents advise that he is still a fugitive from justice in that case, which remains active. Additionally, Bateman is one of the notorious Cayman Gang of Four*, a group of local financial advisers who are reputed to have stolen close to a half a billion dollars from their victims, and then fled Grand Cayman; Bateman is hiding somewhere in Florida. Some observers believe that some of the missing money was laundered in the Bahamas, and also in Cuba, and that Bateman, whose sordid past in securities trading should have barred the Government of the Bahamas from entering into any contractual relationship, had it performed even rudimentary due diligence in advance, intends to use the stolen funds to bankroll an oil exploration operation, in the Bahamas, and in the waters surrounding the Republic of Cuba, a country with whom he also has a relationship. Dr. Minnis is eminently correct; the leaders of the Bahamas should have had no business with Bateman, whose self-serving statements of fifteen years' experience in the petroleum business are a total fabrication. His history indicates that he is a career criminal, leaving victims, first in the Province of Alberta, and now in the Cayman Islands. Apparently, there's nobody in compliance on duty in Nassau; otherwise, they would have disqualified Bateman immediately. * The Cayman Gang of Four are: Ryan Bateman, Sharon Lexa Lamb, Fernando Mota Mendes, and Derek Buntain. The FSB, Russia's security service, reportedly raided the offices of four unnamed Turkish banks this week. While the names were not released to the press, you should carefully examine whether your bank is engaged with the five Turkish banks known to have business in Russia, for the investigations were conducted, based upon claims of money laundering. China has enacted a comprehensive anti-terrorism law. While that is a generally positive development, remember that Chinese authorities regard the independence movement, by its ethnic Uighur minority, as a terrorist entity. More ominously, the new laws place restrictions upon the reporting of what may constitute terrorist acts. If we cannot get the facts, compliance officers are at a distinct disadvantage. This means that there will be even more censorship of negative news from China, which directly affect how we calculate and assess Country Risk. If compliance officers cannot get a true picture of the destabilizing effect of terrorist acts upon the economy, and the stability of certain regions, accurate Country Risk evaluations cannot be made. China becomes even more opaque, and harder to read, meaning that its economy, the safety of foreign business involvement, and the potential for financial crime, caries a higher level of risk. It will mean raising Country Risk for China once again; make your own assessment, review all the facts, and decide for yourself how much to raise risk levels at this time. We all know that ISIS has the passport printing equipment from Syria, and the blanks, but did you know that it also picked up Iraqi blank passports, and the equipment with which to process them ? 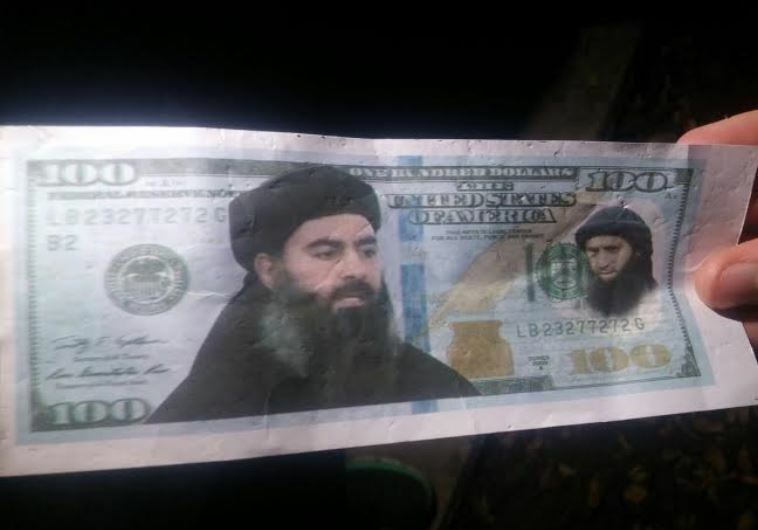 It acquired them in Mosul. Govern yourself accordingly. They may be touted as acceptable, as a primary means of identification, when opening a bank account, or cashing a check, but many New York-area commercial banks are rejecting the New York municipal identification card, commonly known as the IDNYC. While the card has been approved by Federal regulators, to satisfy Know Your Customer and AML requirements, many NYC financial institutions do not accept them. While we must solve the nagging problems of reducing the higher costs that "unbanked" individuals face, the NYC ID card, in my humble opinion is flawed, both in the ease through which it can be acquired by potential money launderers, and the lack of adequate security protections built into the card itself.The big banks have correctly, utilizing their risk-based analysis, determined that money laundering & financial crime can be facilitated, if the fraudsters and laundrymen, obtain and use, the IDNYC. Remember the money laundering that followed the adoption of the Mexican Consular Identification card ? Smurfs could move large sums of dirty money into NY banks, should political correctness cause these banks to accept the NYC municipal ID card. While many banks in the west and southwest have allowed their local municipal ID cards to be accepted for compliance purposes, New York banks are to be commended for their actions. Justice may have been denied for 34 years, but it is finally happening. The American diplomats and US Embassy staff who were held hostage by the Iranians between 1979 and 1981 will now receive compensation, not to exceed $4.4m each; the money will come from the $9bn paid by BNP Paribas, for violating, among other things, Iranian sanctions. The use of specific bank sanctions violations funds to assist the victims of terrorism is not only justice, it again serves to remind us that a major international financial institution deliberately chose profit over obeying the law. The fact that the violations were systemic, and occurred over a period of several years, should not quickly be forgotten, nor the fact that nobody was indicted in the matter. The only personal consequences that I am aware of were terminations of some senior bank staff. Whether that was sufficient punishment I leave for your own judgment. The Financial Crime Blog will be back after Boxing Day. Enjoy your time off; 2016 promises to be even more difficult for compliance officers than this year was. The Palestinian Authority, which has administrative control over portions of Judea and Samaria, formerly known as the West Bank, when Jordan annexed it, and controlled it from 1948 to 1967, has advised that it will, beginning in 2016, issue passports entitled "State of Palestine," to its residents. Ignoring politics, the compliance ramifications of accepting this passport, for any purpose, are extremely dangerous. If you know your history, you know these passports represent a problem. Arabs residing in Judea & Samaria do not have "Palestinian" citizenship, because there is not an independent, sovereign state, nor has there ever been one. 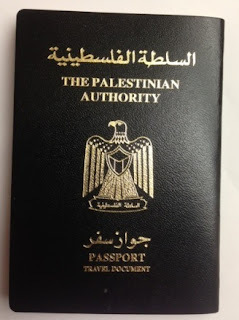 Most of them hold Jordanian passports, or have the ability to acquire one, but such documents do not confer either nationality nor the right of residence in Jordan, which is 60-80% Palestinian, according to most estimates. Jordan was 77% of the original British Mandate of Palestine, until the UK severed it, placing a Hashemite ruler upon the throne. These Jordanian passports held by Palestinians are, however, recognized in many countries as acceptable travel documents. History aside, the massive level of corruption in the Palestinian Authority means that literally anyone who has sufficient cash will be able, one way or another, to secure one of these new passports. this means members of Specially Designated Global Terrorist (SDGT) organizations could show up at your bank to open an account relationship, meaning you could be banking a member of Hamas, Palestinian Islamic Jihad, or some other sanctioned group. There are also Palestinians fighting in Syria with Hezbollah, who could acquire them. Trust me, there will be no due diligence performed in Ramallah, the administrative capital of the PA, when these passports are issued. Accepting any of them, for customer identification purposes, is inconsistent with any risk-based compliance program. While some EU banks may deem it politically correct to do so, they could be exposing themselves to a charge of Providing Material Support to a Terrorist Organization, in the United States, as US Dollars always seem to figure into terrorist financing operations. Martinelli, who has been living openly in Miami of late, reportedly expressed anger at the Supreme Court action; his attorneys have been attempting to interpose every technical legal roadblock possible, in a futile effort to delay the cases, including Martinelli's bogus appointment to the Central American Parliament, and denying that he has received proper notice of the proceedings. Will Panamanian pressure to extradite a corrupt leader trump Martinelli's alleged deal with the United States ? Most observers have assumed that the rumors about his reputed status, as a Cooperating Individual for a US law enforcement agency, are true. Whether Martinelli ever faces justice in his native Panama is an open question. The offshore banker/Ponzi schemer, R Allen Stanford, has filed a Petition for an En Banc Rehearing, with the Fifth Circuit Court of Appeals. The Fifth Circuit has previously affirmed his Federal criminal conviction, in an opinion on October 29, 2015*. (1) That the October decision conflicts with other decisions rendered by this Court, also with decisions of other Courts of Appeal, and with decisions of the US Supreme Court. (2) That "this case involves questions of exceptional importance." Statistically, most petitions for rehearing en banc present nothing new, and are generally denied. You may recall that most of Stanford's appellate issues had no legal basis. He is currently scheduled for release in the year 2105, meaning that he will die while in Federal custody. Juan Carlos Varela, Panama's beleaguered reform president, has come out and asserted that both his country's financial institutions, and government, have been long infiltrated by powerful organized crime groups, a situation that he will not tolerate. Varela came into office on a reformist platform, and immediately began an anti-corruption campaign, seeking to cashier corrupt judges and government officials from the administration of his predecessor, Ricardo Martinelli, now himself facing criminal charges. If you saw the photo, posted here Friday, of the large bulk cash seizure that took place in Panama, the fact that the individual arrested was a government employee was only the latest in a string of offenses committed by corrupt government officials and staff members, whose affiliation with known drug gangs is a sad fact of political life in Panama. Likewise, the fact that Panama's firmly entrenched organized crime group, composed largely of individuals of Middle Eastern extraction, owns or controls many of Panama's money laundering banks, has frustrated any efforts to control financial crime in the Republic. Mainstream Panama city newspapers and television stations refused to carry the president's strong remarks, reinforcing the fact that corrupt influence extends to the media as well. Some observers, who have questioned why the United States is not very active in the current anti-corruption efforts, and in money laundering investigations, have concluded that the Panamanian financial and governmental structures are so rotten with criminal infiltration, that any effective clean-up is impossible. Foreign capital has been leaving Panama, in significant numbers, of late, and it is not being replaced by new "flight capital" that is legitimate. Is Panama on downward spiral ?
" Like many financial institutions around the world, including others in the Caribbean, two of Cayman National's businesses, Cayman National Trust Co. Ltd. and Cayman National Securities Ltd., have been under investigation by the US Department of Justice (DOJ) with respect to potential violations of United States criminal laws relating to the evasion of tax by US taxpayers. ... the Board of Directors has decided that it would not be prudent to declare a dividend at this time. " (1) The amount of the fine may be linked to the bank's net profits for the year, CI$5.6m, which is an increase of 68%, according to the bank. Perhaps the shareholders, who will not be receiving their dividends this year, as the result, will agitate for reform. (2) Why are "necessary remedial actions" not complete at this time ? Obviously, those who engaged in this conduct must be terminated, but I fear that they were merely reassigned to another department or division. And why is there no mention of changes to the Compliance program ? (3) Stating that other banks have also been targeted sounds like the bank is seeking to place blame on the United States; I see no apology here, or anywhere else in print. Read the above, and judge for yourself. It appears that the bank's statement infers not that it is sorry about its conduct in the matter, but it is sorry that its subsidiaries were caught. Derek Buntain, the president of Dundee Merchant Bank, the Grand Cayman brass-plate bank accused of illegally transferring more than USD$450m, and a reputed member of the criminal conspiracy known as the Cayman Gang of Four, has abruptly tendered his resignation, as a director of Dundee Precious Metals, Inc., a position that he had held for twenty-two years. Dundee Merchant Bank is a defendant in a civil suit, brought by one of the Canadian victims of what some believe is a Ponzi scheme, operated by the Gang of Four, who covertly took possession of investor funds entrusted to the bank. The bank, and Dundee Precious Metals, are both reported to be subsidiaries of Dundee Corporation. Buntain has been missing and unavailable since the summer of 2015, when the scandal involving the missing money became public knowledge. He has accused, by Sharon Lexa Lamb, of drafting the instrument that was used to deceive investors into believing that B & C Capital, Ltd., a shell company operated by a known fraudster, Ryan Bateman, was a financial institution. Lamb made that statement, in the presence of several eyewitnesses in Grand Cayman, when she was confronted regarding the missing $450m. Journalists have sought to locate him on Prince Edward Island, without success. He has a residence and extended family living there, and a show horse, but he cannot be found after diligent search and enquiry. Frank Spinosa, the TD Bank Senior Vice President who wrote the infamous "lock letters," which falsely warranted that the bank had large restricted accounts for the investors in Scott Rothstein's bogus court settlement Ponzi scheme, was sentenced this week to two and one-half years in Federal Prison. Spinosa was terminated by the bank when the details of the billion dollar fraud came to light. The sentence handed down in US District Court* was shorter than the recommended guidelines, and there were some health considerations, but some observers may question the length of the sentence, inasmuch as the defendant was a banker, and one of the purposes of sentencing is to act as a deterrent, to prevent others, similarly situated, from considering engaging in criminal conduct. Was the sentence to short, given the size of Rothstein's Ponzi scheme, and its impact upon the victims ? The other issue, which will now not be resolved, since Mr. Spinosa has entered a plea, and there will never be a trial, is whether any other senior officers at TD Bank had any knowledge of the Rothsteib fraud; he was a lucrative client for the bank, and even the most rudimentary due diligence inquiry would have revealed that there were no lawsuits filed, to support Rothstein's claims of a boatload of employee discrimination, and sexual harassment lawsuit settlements available for investors. In any event, Mr. Spinosa, who had experienced legal counsel, ends up with a relatively short sentence, when compared to many of the other 28 Rothstein defendants. Whether there will be any others ultimately charged in this scandal, including other TD Bank officers, is not known. * United States vs. Spinosa, Case No. : 14-60257-CR-BLOOM (SD FL). 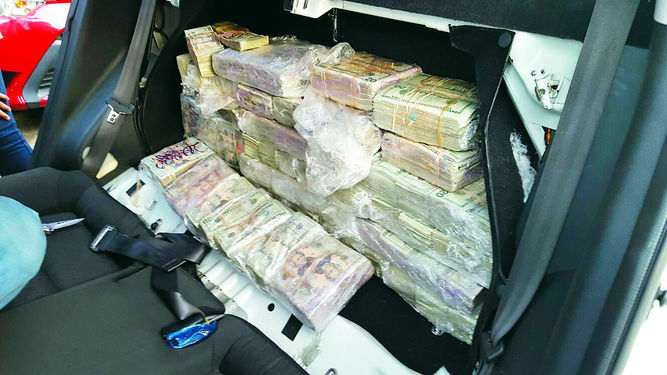 Drug profits continue to flow into Panamanian banks.This is $856,000 in cash, located in the back of an automobile, which was seized in the Republic of Panama in a drug money laundering investigation. According to the authorities, it represents narco-profits generated by traffickers in Guatemala & Honduras. A court in Beijing has commuted the death sentence given to Gu Kailai, the wife of the former prominent Chinese politician Bo Xilai, to a life sentence. Gu was convicted of murder in the death of British businessman, Neil Hayward, in a high-profile case that exposed the sordid underbelly of rampant corruption among China's elite. Her cold and calculating nature, and arrogance, caught the attention of all those who considered China as a golden opportunity. The Gu case, where the greedy quest for bribes and kickbacks, of the two PEPs, was detailed, to the discomfort and pain of the Chinese Government, served as a wake-up call for Western businessmen seeking to turn a tidy profit by doing business in China. Since Gu, most Westerners have become more cautious with China, particularly in matters where their expected conduct, the illegal payment of gratuities, violates the corrupt practices laws of their home country. Bo Xilai is also serving a life sentence, after a conviction for corruption. The Cayman Gang of Four had a policy for dealing with their victims; how to discourage any of the over sixty Canadian & American investors who requested that some of their money be sent to them: lie, deny and, if necessary, threaten. When an investor asked for a wire transfer of a portion of their funds, the Gang, and specifically Sharon Lexa Lamb, would throw up any one of an assorted list of excuses, none of which were true. For example Lamb, who was answering "Dundee" to all callers, notwithstanding that she had been fired more than a year earlier, would tell callers that there were delays, due to compliance requirements, at the 'bank' where the funds were kept. (of course, the money was held by Ryan Bateman's shell companies, not a bank) Alternatively, she would ask the victims for information on their Source of Funds, even though the money had been passed through two prior financial service firms in Canada. These were lies to delay access to the clients' money. Was this a violation of her fiduciary obligations ? You bet it was. Finally, when these excuses were ineffective, Lamb would threaten to turn in the victim to his or her the tax authorities, reporting them for tax evasion. Whether some of the victims had not reported all their income on investments to the taxman is not relevant, for Lamb was desperate to avoid the truth: Ryan Bateman and the Gang of Four had their money, and it was gone forever, as are Bateman, Derek Buntain, and Sharon Lamb who notwithstanding her statements, has not been seen in public in Grand Cayman since the civil suit was filed against her. Of course, the pressing question is : Where is the Cayman Islands Monetary Authority (CIMA) on this ? Asleep at their desks ? Who will wake them up ? Will it take UK intervention at CIMA to get justice in this case ? The disclosure yesterday, that a Texas plumbing company is suing AutoNation for $1m, when a truck it sold the vehicle auctioneer ended up in ISIS hands, means that Western bank compliance officers should reexamine any and all international trade transactions between their clients, and customers in Turkey. It is one thing to read about ISIS oil being sold in Turkey, and another to see the logo of your American company on a truck being used in Syria, by terrorists. 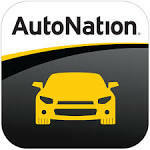 AutoNation, after promising to remove the logo, negligently failed to do so. and thereafter sent the truck to Mersin, in southern Turkey, a stone's throw from Syria. Doesn't the company have any compliance officers over there ? Frankly, the time has come for bankers to advise their clients to avoid all trade and financial transactions with Turkish companies, lest they end up publicly named & shamed by OFAC, in an expensive and embarrassing Civil Penalty fine case. Turkey is obviously providing assistance to ISIS; it is immaterial to know whether its companies are being paid. The prudent thing is to red-line all transactions at this time, and to advise bank clients that they jeopardize their relationship at the bank by ignoring your advice. WHERE ARE THE TWO CANADIAN GANG OF FOUR MEMBERS WHO FLED THE CAYMAN ISLANDS ? He has been missing for a number of months, but is believed to be living on Prince Edward Island (PEI), where he has a home, and where other members of his extended family reside. Internet traffic indicates, with a high degree of probability, that he is monitoring the news of the first civil suit, brought by a victim, against Ms. Lamb and the Dundee Merchant Bank, from PEI. he has not returned to his residence in Grand Cayman. Ryan Bateman, a native of Alberta, and the owner of the shell investment companies, B & C Capital, Ltd., Bateman & Company, Ltd., and Bateman Capital is believed to have transferred, without authorization, all the capital of the victims into his corporate operating accounts, and thereafter, to have engaged in multiple transactions, involving the purchase and sale of securities, through financial institutions located within the United States, and in the Bahamas. He failed to appear for a criminal trial in the Cayman Islands, where he is a defendant, and is regarded there as a fugitive. His efforts to sell his expensive Cayman residence, and to transfer the funds out of the country, reportedly were blocked by the authorities. Bateman, based upon Internet traffic monitoring, is reportedly living quietly in the State of Florida, most likely in South Florida. Due to the violent nature of his pending criminal case, and his obvious wish to avoid publicity, readers are urged not to interact with him, in any way, should you come into contact with him. Don't these two Canadians have licenses to sell securities ? Should they not be under review at this time ? Sharon Lexa Lamb, the reputed leader of the Cayman Gang of Four, who is being sued for the theft of $450m, by a Canadian investor, has filed a counterclaim for defamation, against the plaintiff, as well as two whistle blowers, including this blogger, in an effort to control further news about her central role in the massive Cayman Islands trading scandal. She also has avoided any responsibility for the losses, which occurred when Lamb illegally transferred the victim's funds, which was a violation of her fiduciary responsibilities. Lamb, who has previously threatened legal action, should her name be mentioned in coverage of the illegal transfer of investor money to a shell company controlled by a known fraudster, Canadian national Ryan Bateman, alleges that the plaintiff, a prominent retired Toronto attorney and Queen's Counsel, improperly assisted whistle blowers, by giving them details of the case, including threats and demands made by Lamb's counsel, which counsel did not want made public. The plaintiff has reportedly denied the defendant's allegations. Suing a whistle blower, what is generally referred to as "shoot the messenger," is a futile effort to control the flow of news about the case to the investing public, including the other sixty victims of the Gang of Four, who are financial professionals accused of looting hundreds of millions of dollars of investors' money, for their own use. Lamb alleges that the news about the scandal amounts to defamation, though the truth about her prominent role in the fraud is supported by documentary evidence. The case has been cited as a prime example of the repeated failure of the Cayman Monetary Authority, CIMA, to take any action to protect foreign investors who lose assets placed in the Cayman Islands. CIMA has not shut down B & C Capital, Ltd., the Gang's corporate entity, which took the victims' money, nor even interviewed the members of the Gang of Four, who are Sharon Lexa Lamb, Ryan Bateman, Fernando Mota Mendes, and Derek Buntain. Is CIMA merely a paper tiger, who never displays its regulatory enforcement teeth, when confronted with financial crime ? Should it be disbanded, and replaced with an effective agency ? WILL PANAMA NOW DEMAND THAT THE UNITED STATES EXTRADITE RICARDO MARTINELLI ? Panama's former president, Ricardo Martinelli, failed to attend a mandatory appearance before a court in Panama City,where he is charged with conducting illegal electronic surveillance, and he has been held in contempt of court. On then-President Martinelli's orders, his National Security Council illegally intercepted email, telephone call, and other communications, where there was an expectation of privacy. Martinelli, who faces a potential maximum sentence of twenty-one years of imprisonment, spied upon over 150 Panamanians, who were opposition leaders, journalists, and prominent members of Panamanian society and industry. He allegedly fears for his physical safety, should he return to Panama, and has claimed that he cannot get a fair trial at this time. The ex-president faces a dozen other cases in Panama, and there has been a growing movement, among Panamanians, for him to face justice for his corruption, human rights violations, and illegal surveillance program. The Supreme Court of Justice can now file extradition papers in Washington, seeking Martinelli, who is now living comfortably in Miami, where many former dictators have retired to. The question is, will reformist President Varela demand that it take that step ? Or will Martinelli have the last laugh, at the expense of the people of the Republic of Panama ? Sharon Lexa Lamb, the leader of the Cayman Gang of Four, ran an illegal operation after she was terminated by Dundee Merchant Bank in 2013, deceiving investors in believing that she was still affiliated with the bank. Lamb took over the bank's telephone number, and, answering it as "Dundee," defrauded Canadian and American retirees, by facilitating the unauthorized transfer of their assets to B & C Capital Ltd., to fugitive trader Ryan Bateman. An estimated $450m cannot be found, and is feared lost. In a court filing, in a case pending in the Grand Court of the Cayman Islands, Dundee Merchant Bank, through its attorneys, has stated that Lamb's employment, as Senior Vice President "terminated on December 31, 2013, and thereafter Ms. Lamb had no relationship with TDMB [the Dundee Merchant Bank], or any other company in the Dundee group." Lamb, who is a defendant in that case, is known to have represented herself as a bank representative, to individuals who called the bank's number, until the scandal broke, in the summer of 2015, falsely assuring investors that their money was in safe hands at a financial institution, B & C Capital, which was a shell company owned by a career criminal. In truth and in fact, their money was being illegally traded by B & C Capital's Ryan Bateman, who had fled Canada after engaging in securities fraud there. It is not known what Bateman did with the missing money; he failed to return to the Cayman Islands to face a felony charge, and promptly disappeared. Some sources claim that he is living in the United States. The import of the Dundee Merchant Bank filing is that Sharon Lexa Lamb held herself out as a bank officer, years after she was fired. She, and former bank president, Derek Buntain, were reportedly ordered to liquidate the bank, by Canadian regulators, after its parent was sold, but intentionally failed to do so,and ran an illicit operation, for their sole financial benefit, with millions in client money. Buntain has fled to Canada, and his current whereabouts are unknown; he is believed to be living in Prince Edward Island. Lamb has denied liability for the losses suffered by the victims, refused to turn over documents, and will not cooperate, unless and until she receives immunity from criminal prosecution. Lebanese-owned FBME Bank Ltd. (Cyprus), more commonly known by its former name, the Federal Bank of the Middle East, has been fined 1.2m Euros, by the Central Bank of Cyprus, for both money laundering, and terrorist financing, deficiencies. This action has been expected for some time, though the size of the fine was a surprise. (1) The bank was involved in the financing of Hezbollah, a Specially Designated Global Terrorist entity. (2) The bank did business with organized crime. (3) The bank allowed known fraudsters to operate accounts there. (4) The bank was engaged in sanctions evasion activities involving Syria. FBME, a subsidiary of a Lebanese bank, operated in Cyprus, though it has gone through a number of jurisdictional relocations, including a period where it was domiciled in the Cayman Islands. Its current base is in Tanzania, though 90% of its business was through its Cyprus branch. Readers who wish to review the complete text of the Central Bank statement oh the imposition of the fine can access it here. Jeffrey Webb, the former head of the Cayman Islands Football, and who had pled guilty to his involvement in the massive FIFA corruption probe, has been cooperating with US law enforcement authorities in their investigation into the payment of millions in bribes and kickbacks. His assistance has reportedly been a major factor in the recent indictment of additional FIFA executives. 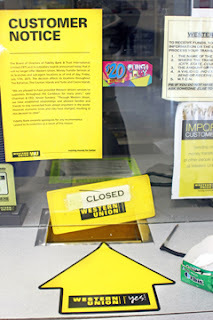 Webb was the Business Development Manager at the local Western Union money service business, which was closed without warning in July; Webb was arrested in May. The MSB was a subsidiary of Fidelity Bank (Cayman) Limited, whose parent, Fidelity Bank International, Limited, is located in Nassau. Bahamas. WUs abrupt closing: due to Webb's arrest ? Fidelity was one of the financial institutions named in the superseding indictment, for having moved a portion of the bribe money paid to him. Webb reportedly has named more than one dozen Panamanian corporations as entities through which bribe payments were facilitated to those individual indicted. A recent increase in money laundering activity in Belize will only be stimulated further by the new nonstop service from Panama to Belize that was initiated this week by Copa Airlines. Money laundering Panamanian attorneys have increasingly turned to Belize, to conduct their illicit operations, and there does not appear to have been any meaningful local law enforcement response by Belizean law enforcement agencies or regulators. There have been multiple cases involving a Belize nexus in 2015. Toronto authorities announced this week two arrests in the $93m pyramid scheme known as Banner Brokers, where the schemers used accounts in Belize to launder the proceeds of crime, employing a bogus Internet advertising company. The United States has accused the Government of Syria of purchasing oil from ISIS, in violation of international sanctions, and a Belize company has been sanctioned for being a major participant. We have seen several other new cases this year, involving Belize banks, and American and Canadian fraudsters and securities traders. In the past, the country's financial institutions have banked Convicted Colombian billionaire Ponzi schemer David Murcia Guzmán, the insider trading Panamanian government officials in the Financial Pacific-Petaquilla Mining scandal, and the admitted Panama City money launderer, attorney Ismael Gerli. Given the country's small economy, and lack of significant trade with North America, the chances that any financial transaction between Belize financial institutions, or corporations, involves only criminal activity has increased in recent years, as its popularity for illicit activity has soared. Now, due to increasing the ease of access, for those in Panama's legal profession who regularly engage in the laundering of the proceeds of corruption, and narcotics trafficking, one can only expect it to continue to rise. For these reasons, compliance officers should increase Country Risk for Belize at this time, after making their own due diligence and inquiry. The professional football world, already reeling from the fallout surrounding the indictment, and guilty plea, of former Cayman banker Jeffrey Webb, the CACACAF president, and FIFA vice president, on $10m corruption charges, the US Department of Justice brought in additional defendants, in a superseding indictment of other corrupt senior FIFA officials. Webb recently entered a plea of guilty, and is awaiting sentencing, while under house arrest in the United States. He will be disgorging millions of dollars of bribe money. (3) For further credit to a Citibank account in Florida. Who controlled that account, you ask ? An attorney in Grand Cayman, who has close ties to local Cayman football organizations. He was, according to the indictment, called before a Federal Grand Jury, in the United States, to give testimony about the transaction. Remember, when you take the proceeds of crime, in this case a bribe, and move it through the global financial system, to disguise it illicit origin, or to deliver it to the recipient, you have committed money laundering. That is a 20-year felony in the United States. This unnamed lawyer, whose identity is common knowledge in the financial community of the Cayman Islands, was not charged in the indictment, nor can I find him charged anywhere. Did he receive immunity from prosecution for his cooperation ? Unless there is a sufficient deterrent, when individuals, especially attorneys, who possess special skills, and can artfully hide their dirty clients behind the attorney-client privilege, commit money laundering, others will be tempted to break the law, as they do not fear the consequences. Who am I referring to here ? (1) He is living openly in Miami, notwithstanding that a dozen pending cases, some criminal, have been filed against him in his native Panama, but American media have strangely refrained from reporting this fact. (2) He was singlehandedly responsible for literally bankrupting the budget of the Republic of Panama, through massive corruption, kickbacks and payoffs. (3) He, and his cabinet ministers, business partners, and other associates, illegally made many millions of dollars, through insider trading of securities, in the Petaquilla Gold Mine scandal. (4) He laundered millions of dollars, much of which was Colombian narcotics profits, for convicted Ponzi schemer, David Murcia Guzmán. (5) His illegal surveillance program invaded the privacy of over one hundred Panamanian judges, opposition politicians, and prominent businessman, and their wives, and he forced their wives and girlfriends to engage in sexual relations with him, through blackmail. and threats of exposure. (6) He ordered Panama's regulators to ignore rampant money laundering in the country's banks and money service businesses, and insured that any civil suit brought by his opponents went nowhere, through bribes, intimidation, and the granting of favors to the judiciary, including many members of the Supreme Court of Justice. (7) While in office, he associated with many prominent members of Panama's organized crime syndicate, which includes many players of Middle Eastern (e.g. Syrian) origin. The individual who committed all these acts is the former Panamanian President, Ricardo Martinelli, who apparently has been a Confidential Informant for A US law enforcement agency for an unknown period of time, and is now enjoying the benefits of residing in Miami, with all his ill-gotten billions of dollars, so long as he continues to give up information on Panamanians engaged in criminal activity, including corruption. Indeed, Martinelli may have played a major role in supplying the evidence used to convict several major Panamanian government officials of late. Martinelli has the proverbial "Get out of Jail" card in the United States, and Panama's new reform government is the loser. You could say that crime pays, when you have high-level friends in an agency of the US law enforcement community, that has little or no accountability to the US Congress, or the American public, for its conduct. Is the war on drugs that important that we continue to give the worst career criminals a pass, so long as they assist us ?